I, for one, am not a huge fan of spinning rides. They very often make me dizzy. Now, I can handle rides that move in a circular motion, as long as that motion isn't pure spinning. Scrambled Egg rides, attractions like Mater's Junkyard Jamboree, and even carnival thrill rides like Tangos are surprisingly tolerable. But place me on the Mad Teacups, and I'm out for the count. Roger Rabbit's Cartoon Spin, with Roger's fountain in the foreground. Despite this, I hold great esteem for Roger Rabbit's Cartoon Spin--a very spinning ride (though fortunately, the spinning is all rider controlled) that, really, is one of Disney's best dark rides. 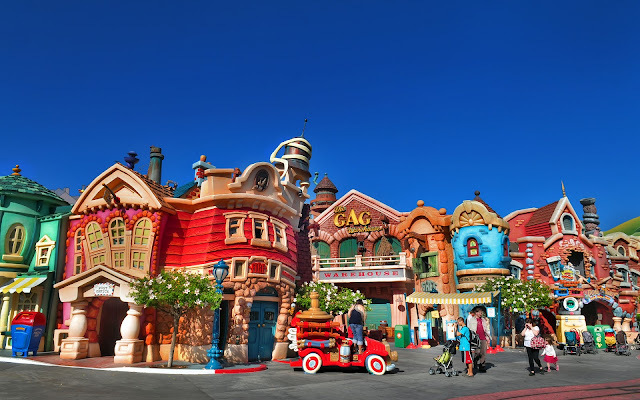 Delightfully themed and featuring some surprisingly convincing and impressive special effects, this attraction bounds through Roger Rabbit's loopy world of cartoon shennanigans, battling Weasels, avoiding Dip, and saving the curvaciously lovely Jessica Rabbit. This is tremendously fun, and even after all these years, often commands a sneaky long wait time by guests who share the same opinion. 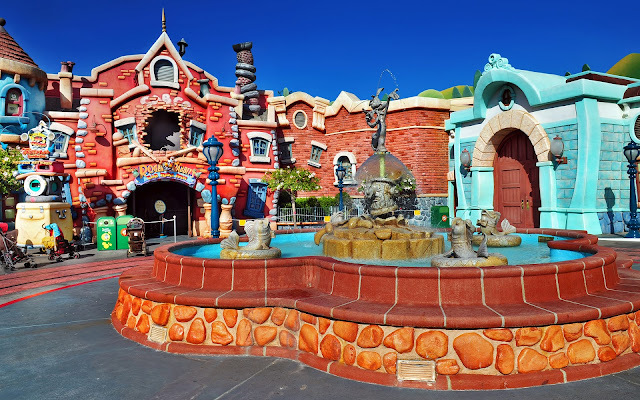 The playful and utterly absurd architecture of Mickey's Toontown. Roger Rabbit's on the right.